We wanted to be able to attend hack-a-thons without having to carry external monitors around when working on things like raspberry pi, and this project makes a completely ar monitor a possibility. Our application uses a unity plugin to map a vnc web socket client onto a texture map, which is anchored to a simple piece of paper through the tech of vuforia. We used git to track version progress, and referenced a multitude of tutorials online. ARCore and GoogleVR turned out to have runtime conflicts when operating at the same time, that shifted our anchor placements. We had to switch to Vuforia at the last couple hours in order to maintain stable tracking. How to communicate while developing in a team, make better use of version control, create projects that span across multiple frameworks and build for multiple devices, and have fun while hacking. We'd love to write scripts so that automation of setup is a bit smoother for a user, and develop for better devices that can handle the processing power of AR in real time. Pres. 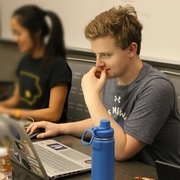 of Computer Comfort, Mentorship chair @ HackIowa, Engineering Dorm RA, Hackathon + Game Jam participant, and open source contributor.